This is a large Christmas Village collection with many accessories. Buildings are in very good condition. No obvious chips or breakage. A couple do have missing flags. After many years collecting and displaying, I have decided to part with it due to downsizing. Houses, power cords, accessories, lights, people, bridges, landscaping, etc. 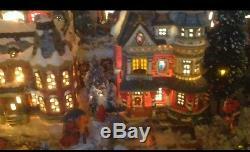 The item "Lemax Christmas Village-Large Lot" is in sale since Wednesday, March 29, 2017. This item is in the category "Collectibles\Holiday & Seasonal\Christmas\ Current (1991-Now)\Villages & Houses".encinitas" and is located in Encinitas, California. This item can be shipped to United States.